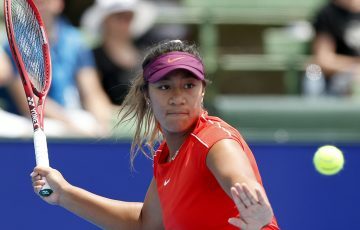 The official Australian Open 2012 website launched today, promising the most extensive coverage in the tournament’s online history. 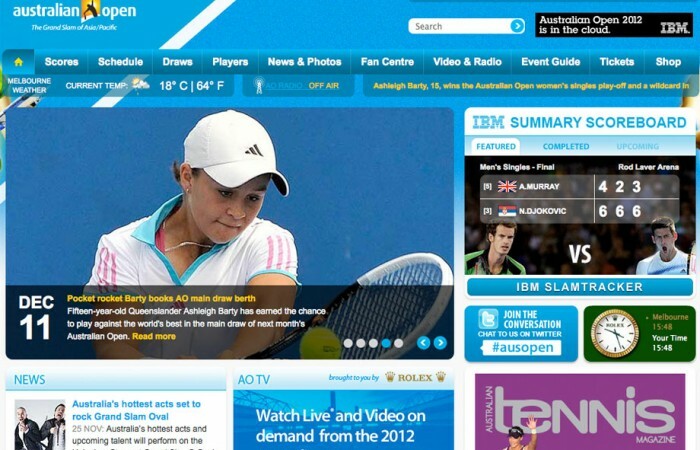 The 2011 audience for australianopen.com exceeded 10 million unique visitors and for 2012 is poised to soar across mobile platforms with a range of new features aimed at maximising the Australian Open experience. Produced by Tennis Australia with technology partner IBM, www.australianopen.com sees the return of a new SLAMTRACKER live scoring application – fully viewable across tablet devices – providing comprehensive match stats across all courts, live text commentary, and a momentum visualiser which predicts the outcome of featured matches based on statistical data.Fans will find their voice within SLAMTRACKER, adding comments through Facebook connect and a promoted Twitter match hashtag. AOTV returns with free live streaming* from seven courts ensuring coverage of every point of main draw action. 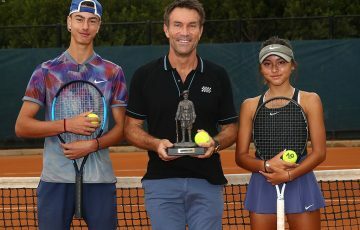 Fans can also follow the Australian Open countdown with worldwide live streaming of AO Qualifying, the official draw ceremony and MLC Kids Tennis Day on australianopen.com and YouTube. AOTV also offers daily highlights, interviews, features and a video archive featuring classic moments from past events. 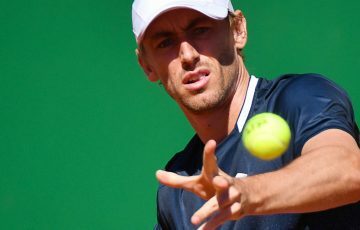 ‘Open Drive’presented by Kia Motors, where players are interviewed en-route to the tennis, also returns for 2012. 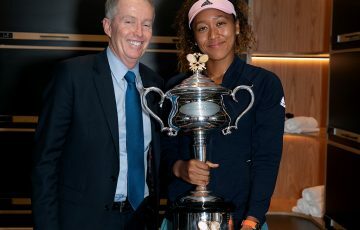 From 1 January YouTube will feature daily highlights, interviews and off-court features on from Australian Open Series events in Brisbane, Sydney, Hobart and the World Tennis Challenge in Adelaide. 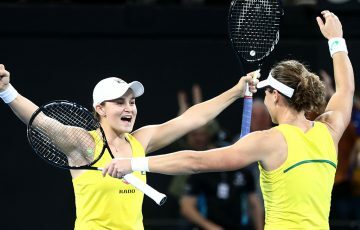 Australian Open digital is also proud to release the AOTV VAULT – an exciting new asset housing 113 full-length tennis matches captured at the Australian Open between 1998 and 2011. 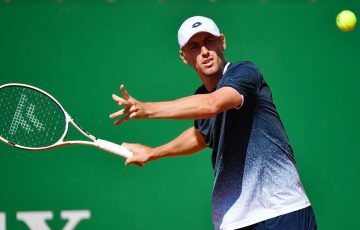 Each match has been curated so users can easily find important moments, whether searching for highlights, set points, match points, break points, cracking aces, epic rallies and sensational winners. Matches can be filtered by player, year, championship matches, by classic matches, by great comebacks and upsets, and moments can be shared with friends via e-mail, Facebook and Twitter. This exciting new video treasure chest – vault.australianopentv.com – has been developed in partnership with Thought Equity Motion, who has produced similar successful platforms for American men’s basketball and football. History buffs will appreciate the RESULTS ARCHIVE which includes every draw, scores and individual player data from the first year the Australian championships were played in 1905.As the Australian Open Facebook page edges towards 500,000 friends, coverage will continue to embrace social media, engaging with fans 24 hours a day in a new FAN CENTRE on www.australianopen.com. FAN CENTRE seeks to discover the ‘social media champion’ of Australian Open 2012 by tracking how top players are trending on the website. Fans can influence a player’s ‘site ranking’ by contributing to the Twitter chat and ‘liking’ content across the website. The new PICK ‘EM game in FAN CENTRE enables fans to challenge their friends, set up leagues or win daily prizes in the Australian Open PICK ‘EM rounds, culminating in an overall winner. The AO TRIVIA CHALLENGE is an addictive tennis knowledge drill with a leaderboard on Facebook. In 2011 more than 700,000 fans updated or downloaded the official iPhone app developed by IBM, and mobile site page views across the board increased to eight million, marking a 63 per cent increase. The free iPhone app returns with live scores, draws, schedule, photos, news and a new GPS feature to locate key activations onsite. A new Android App has also been developed by IBM and is available for download for the first time. Both apps, smart phones and the mobile site – m.australianopen.com – will live stream AO RADIO – with play-by-play coverage from Rod Laver Arena and Hisense Arena. 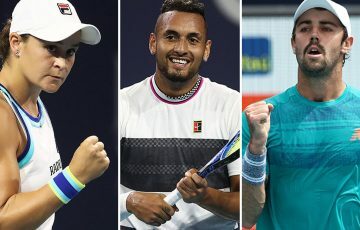 Delivered by a team of international tennis broadcasters, AO RADIO is also streamed live offwww.australianopen.com and can be heard on 99.7 FM around the grounds and within several kilometres from Melbourne Park. The Official Australian Open Program is available for download free of charge from 16 January 2012 in a new iPad app presented by ANZ. The digitised program includes extended photogalleries and videos, as well as live scoring and daily news from Australian Open 2012.